According to a study, the average human will spend more than five years and four months of their life scrolling through the social media abyss. It’s a horrifying amount of time, especially when you put it into perspective: In that same amount of time you could climb Mount Everest 32 times, watch The Simpsons series 215 times, fly to the moon and back 32 times, or walk your dog 93,000 times. Also this: The average person will spend only a year and three months of their life actually socializing IRL. Yikes. While we could try to persuade you to throw your phone into the closest body of water, book a one-way ticket to Bali, and live an enlightening life off the grid, we’re realists who want to see you succeed living a balanced, fulfilling life both online and off. In that spirit, we’re believers in filling your feed with all things inspiring, particularly people (and animals) who rouse your spirit and motivate you to live your best life. Caroline Ingraham Lee is one of these people. 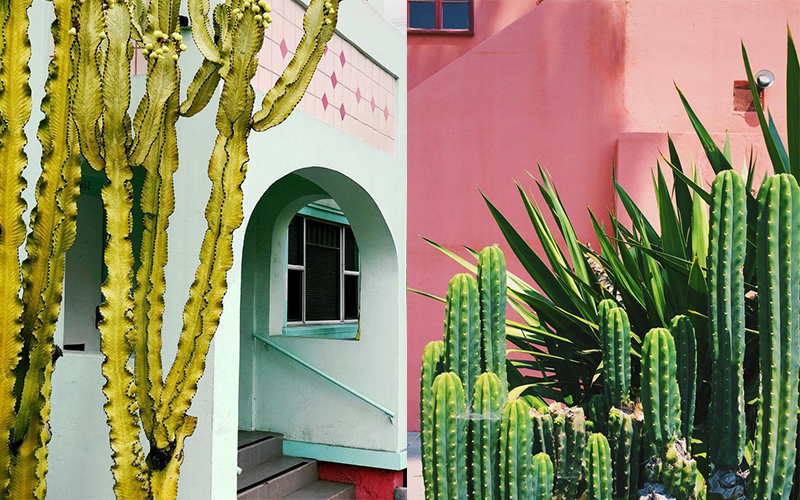 The L.A.-based photographer’s Instagram is an endless stream of colorful, artfully composed moments. Whether they’re snaps of stunning interiors or close-up shots of L.A. foliage, her photos are always a lovely reminder of how stunning our city is. Get your fix at @teamwoodnote. Was there a distinct moment when you remember falling in love with L.A.? What’s your ideal L.A. Day? The sunshiney, breezy kind. So basically 360/365 are ideal each year. Sometimes looking at current photographers for inspiration feels like it could verge on copying, so I like to reference and study old works. Lee Miller is a favorite. When you’re in a creative slump, what do you do to re-energize? Travel. I’m often traveling internationally, but sometimes just getting in the car and driving the streets in another part of L.A. is enough to get my eyes and brain seeing things differently, and getting excited to create again. Hobby you’ve been wanting to pick up? If you didn’t live in L.A., where would you be? Melbourne. I lived there for two years and just adore it. What movie would you want to live in/photograph? Nocturnal Animals for the use of color and Eternal Sunshine for the soundtrack…but oh, this question could keep me going for days! If you could photograph aliens or dinosaurs what would you choose? Aliens. We know dinosaurs existed, but I would like to prove that aliens do. Ellen and Flea for Gucci. Hey. It’s L.A. It could happen!